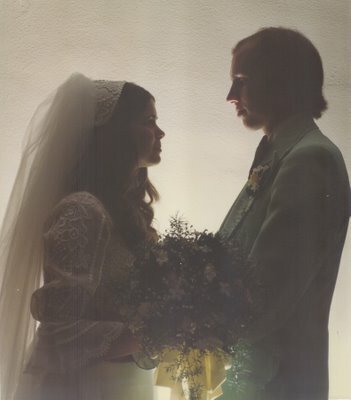 Krista & Tim - Our Photo Journal: What were you doing 31 years ago? What were you doing 31 years ago, today? We were saying our vows to each other and have spent the last 31 years keeping them. Thank you, Tim, for everything! God has truly blessed us and our family. I look forward to many more happy years together...just can't predict exactly where they will be...but the adventure has been remarkable. Thanks for sharing the good times and the bad with such faithfulness and love. Thanks for giving me 3 wonderful daughters, and all that has resulted...Chris & Jack, soon Jason, and who knows what our future holds when it comes to more family? Thanks for giving me the world...places I never even dreamed about seeing in my lifetime. Thanks for sharing your faith in our awesome God. "Great is His Faithfulness." P.S. There was another thing we were doing 31 years ago...Wishing my sister, Debbie, a very Happy Birthday!!!! We love you! Congrats mom and dad, jason and i only hope to be as happy as you guys after 31 years of marriage. Yay for you guys! What a great post! I love the picture, too. I think Libby has her dad's profile!